Over the last few weeks I have being making a conscious effort to go through the makeup and skincare products that I have accumulated. Whilst I do not entertain quite the amount as some beauty bloggers I have seen, I was starting to feel more than a little overwhelmed. In a bid to be more minimalist, not just in the wardrobe department but in my daily life too, I made the decision to get rid of a few things which were either too old or which I simply didn’t like. This has allowed me to get started on a few new beauty items which is quite exciting, as after all, being a beauty blogger one of the main things I enjoy is trying out new products as you just never know when you will discover something amazing. The Maybelline Master Sculpt* was a product which I saw featured across a variety of blogs last year when it first launched. To be honest with you I have always been a tad sceptical about high street contour and highlight products, although I am becoming more open minded as time goes by as the high street really is starting to expand in this area more lately. Whilst I have yet to try this I am looking forward to giving it a go very soon. 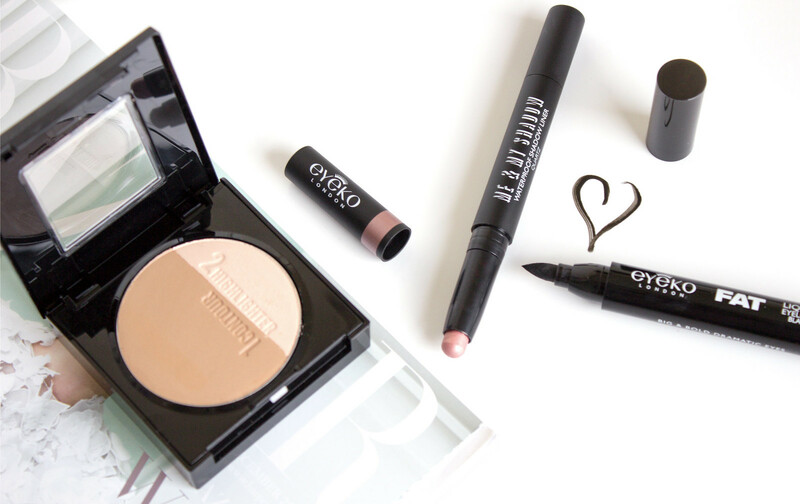 From Eyeko both the Fat Liquid Liner* and Me and My Shadow Cream Eye Shadow* have made their way into my life. As someone who is never one to pass up the opportunity of trying a new liner I have to say that I do quite like the Fat Liquid Liner as it is incredibly pigmented and durable, meaning it lasts really well throughout the day. Whilst I do think I prefer their Skinny Liquid Liner on a whole, I did find this to be a nice alternative for days when I want to create a more dramatic finish. That being said, whilst my experience with the liner has been great I wasn’t too keen on the cream eye shadow which I found to be quite dry to apply. Perhaps in hindsight I may be being a bit too critical as I am comparing it to the likes of By Terry, although the Kiko versions are fantastic for a fraction of the price. The shade I received was Quartz which despite being the Pantone colour of the year I can’t agree that it is mine, at least not where my eye shadow is concerned. Quartz in itself is very pretty however because it is quite a salmon toned pink I find that it just doesn’t suit my skin tone. The next brand is a completely new one to me as up until a couple of months ago I had never heard of ReCover Cosmetics. The ReCover Correct and Conceal Concealer* is a product which requires further testing from me as I have only recently started to use it, therefore look out for this being featured again in a month or so. What I can tell you though is that the shade I have is the light option which in all honesty isn’t that light, although I do note that they are releasing a shade lighter early on in 2016 which I think is a good idea. As I make my way through my skincare the latest brand which I will be trying out is Medik 8. They were kind enough to send out to me quite a few of their products so I am really looking forward to seeing what they do have on offer. Generally speaking whilst trying out new skincare products I do like to only incorporate one or two new ones, this is so my routine isn’t interrupted too much. 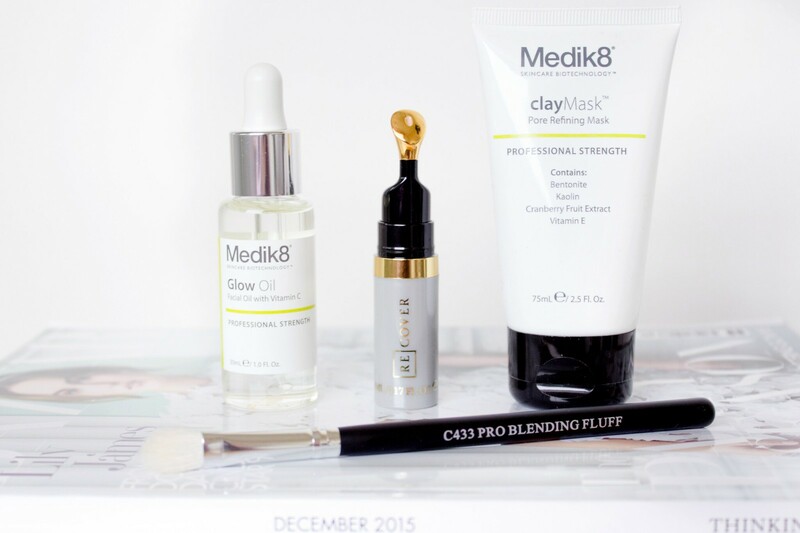 The first product I decided to try was the Medik 8 Clay Mask* which so far I really quite like. The mask first and foremost is extremely gentle and does not dry my skin out, it has quite a medicinal scent to it which I like and it is light in texture and colour. 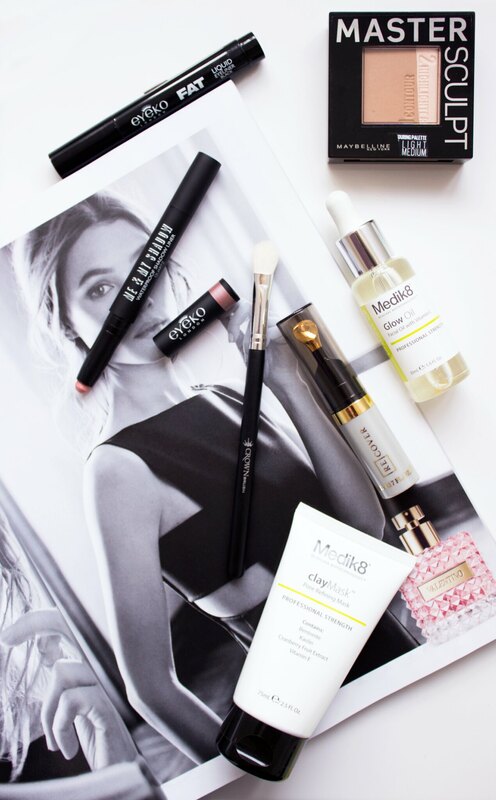 The Medik 8 Glow Oil* is the latest release from the brand, it aims to help with dehydration, visible signs of ageing and to add more radiance to your skin. Due to its lightweight texture I can use this of a morning time before I put on my moisturiser which is really nice as typically with these types of products I can find that they can be a bit on the greasy side. This however is not greasy in the slightest, in fact it hardly feels like an oil based product at all. Currently I am in the very early stages of trying this out so I do not want to commit to anything as of yet, although if you have tried this yourself then I would be really interested to hear how you have got on with it. To round things up I have Pro Blending Fluff Brush* from Crown Brush which has arrived at just the right time as my eye shadow brushes in particular are a bit on the sparse side as I only have two that I use regularly. This doesn’t exactly stipulate what it is specifically for on the website, although it does mention contouring and highlighting. To be honest I think I’ll use it as an alternative to my MAC 217 which tends to be a bit a bit grim looking come the end of the week. As I pop on my eye shadow for work tomorrow morning I will be reaching for this, I am really curious to see how it works for me as I haven’t had any new brushes for a little while now. Have you tried any of the above products?